Impressive physical capabilities. Sturdy and strong, possesses brute strength and great amounts of endurance. Hardly knocked out of balance. Has an immense amount of will, which allows him to endure as much as his body is capable of, but suffers heavy damage as a result if not persuaded to back down. Has a jaw gape of 120 degrees which is necessary if he wants to use his elongated canines. 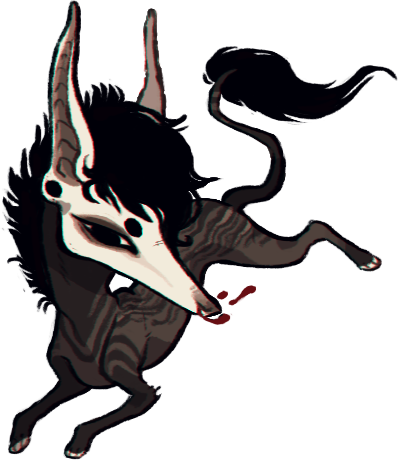 Despite how neat the canines may seem, they're rather fragile and are used only for precise killing only. 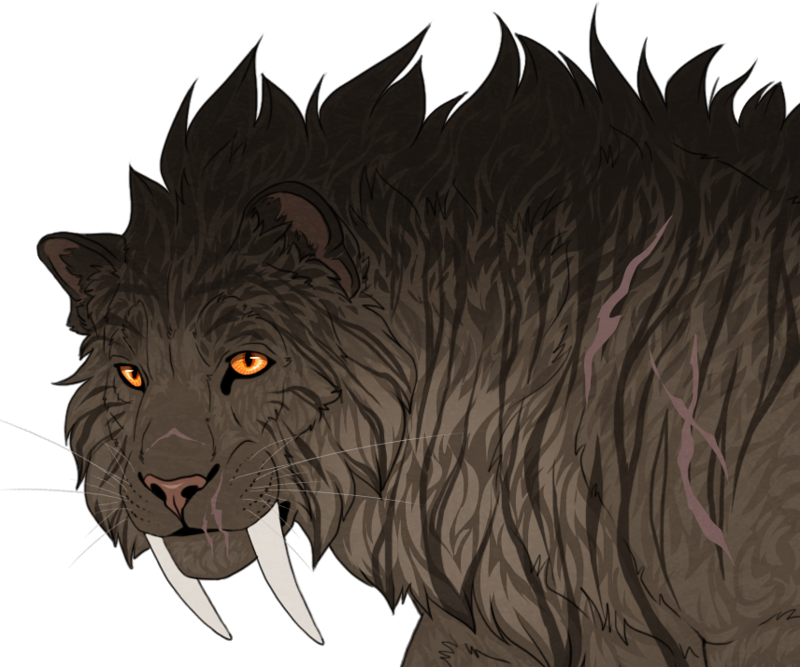 In most cases, Hector will rather use his massive paws which, combined with a set of fine, sharp claws, can inflict large amounts of damage and cause a lot of bleeding as he will tear his opponent with unrelenting force. In addition, claws allow him to grapple onto larger enemies and position himself on them where he could be hardly reached(on their back, for example), allowing Hector to inflict more damage without taking any until he's thrown off. Should a good opportunity occur, he may attempt to ground his opponent and then use his canines for a fatal bite(snap neck or other vital body part) if a kill is what he's going for. Fast, though not than most smaller and more agile species or creatures. A being of pride, utterly confident in himself and his ability to accomplish almost anything he dreams of. Does not expect others to be as great as he is, but never looks down on anyone and instead treats each individual with respect and radiates warmth that welcomes anyone. There's almost nothing (besides himself) that can bring down his confidence or mood for he refuses to willingly grant such power to anyone. Driven by a sense of leadership and purpose, diligent and persistent in achieving his goals. Self-reliant and often helpful should anyone reach out to him, but rarely seeks the help of others himself. Very physical, prefers to express himself through actions rather than words. A cuddle ball with teeth and claws, but very gentle. Very patient and difficult to rile up. Will walk away from any quarrel or a possible fight if he sees no good reason for it to proceed. Refuses to invest precious energy where it isn't absolutely necessary. Would only jump in to protect a loved one or stop unjustified threats towards someone. 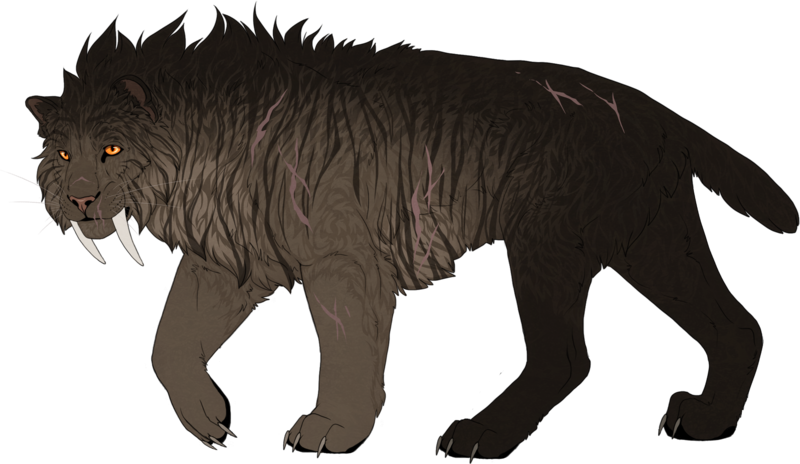 A fierce and brutal fighter, but almost never intends to kill and is willing to relent should he be given a good reason. Adores children and it's the only weakness he would ever admit to having. Vithara & Garai; - Grandchildren via Vittani. 'Lady' - Once infatuated by. Loved dearly and thought of each day even during her absence. Was joyous to reunite with at some point and the old flame was kindled once more, but it didn't last for very long. Has moved on since then, but the memories of her and their time together will always hold a special place in his heart. Pay-Pay - A friendly acquaintance from the past. Presumed gone. 'God-kissed' - A dorable lil' thing. Presumed gone. Karana - Murdered Lady in the past. Sought to kill without success. Now but an unpleasant memory, would avoid should their paths cross again. Greitai, Leila, Nadezdha, Tavis, Umay, Rin. - styling for the body text. - Styling for comments and the edit/reply links. - Styling for blog links. LOL.. Srsly? Never thought that it would be my way of playing that you would recognize me by. ._. Humm... Let's see... I think it was the 'proud', Anti way of walking and staring, mostly. I'm a professional stalker, I make a living of this, you know. - eee wrong account. I'm on my phone. I giggled watching them 8| Hector feels so awkward right now. FFFFFF poor girl. 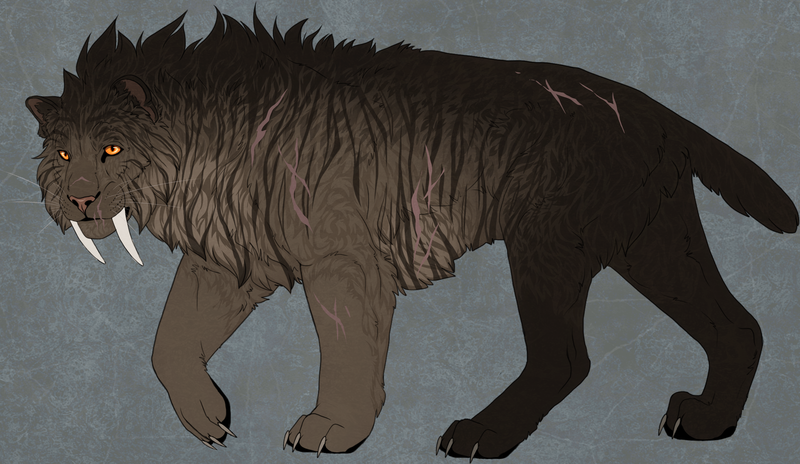 I love that bloody paw and fangs and everything else that has blood on it. But mostly that paw. I also love their poses and how Hector seems to be watching over her. I'm glad you like it c: That paw was probably the most difficult thing out of the whole thing, It didn't wanna co-operate. He is a great character, really Pay-Pay feels a great curiosity for he. Unfortunately I had to go, I hope to be able to be together again another day. Did you not the case today attacked us? if so, accomplish your goal in my blog or here. Yeah, it was Hector. He was protecting the brown mini because she's a friend of his. It wasn't a meaningless "attack" if you thought so. Sorry if we offended you or something. ._. I experienced two attacks from you. One attack on the tiny no reason (and the Beast just added - attacked from the backup). After Quadda was nervous because it is watched and did not go closer, even though it was called. She was greeted, she did not respond, so take it as provocation. After an hour, got fed up and just got a hint, let go (and the second attack from the Beast from the backup Quadda had open wounds, barely attended). I think the two of us took it as a bad end. Note: And now try to befriend the little back and plays the "violin falsity," I can not explain this behavior. The brown doe is Hector's friend, and he did not back her up for no reason. He was protecting the doe. He has made a bad first impression about Quadda and finds her threatening. He is more likely to be hostile towards Quadda despite her friendly intentions. Hector was a bit put off by her current friendly behavior towards him after what he had experienced with her. It's very unlikely that he will accept her quickly. I hope you did not get confused with his actions. He was just trying to push Quadda away, he wasn't really causing any harm to her and won't do so as long as she keeps a respectful distance from him and his female friend. She respects and closer distance when it's allowed. In addition, when before no one persists truly as it takes to become accustomed to its presence. She is calm and when it seeks to make friends and meet, trying to make good steps. But sometimes it just does not work, depending on the mood and nature of the other. In addition, among his friends alone (they have a family, mates...). Do not be surprised that there wanted to be with you, to ward off the feeling of loneliness. If he wants... I think yours, she will open his case and she will contact him. When recover completely. Didn't know where else to post this..
"Dear Hector, I'll have something to say... When you can break and casting a spell over it, come to me. You'll find me... never mind. Somewhere I am, you surely will find me," she told him in a whisper before walked away. /yeah, he would find her if I could see the third gen pctos :D I can only recognize people with 3rd gen's only by their sets, so it would take a while to locate Quadda on the map and then find her in-game. |D Though it's kinda fun, but takes some time. But I'm sure they'll see each other soon. I hope I'll find her. I hope I'll find her. Shouldn't be too hard.. I guess.